Gift ideas for Valentine's Day! 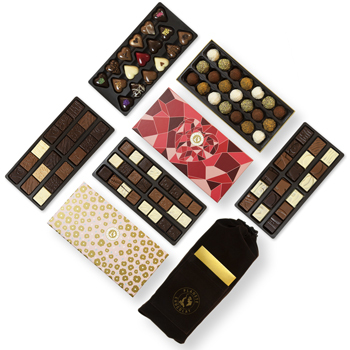 Say it with delicious chocolates ! 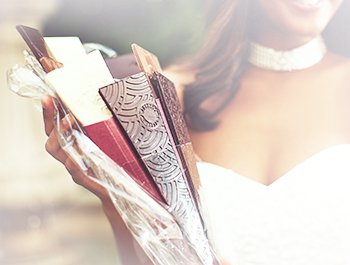 Make your love even sweeter with chocolate. Give a heart-shaped box of chocolates to make your day together even more passionate. 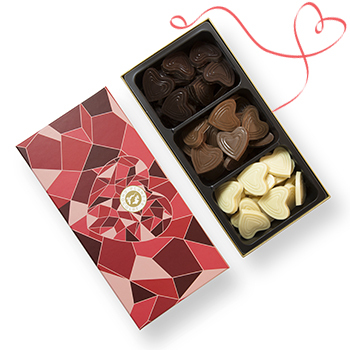 With an assortment of pralines inside a beautiful box, decorated with a heart and geometric patterns in red and pink tones, you’re sure to have an amazing day to remember! On your hearts, get set, go! Delicious hearts to enjoy as Valentine’s Day approaches! 17 skillfully made hearts, full of emotions to savor. 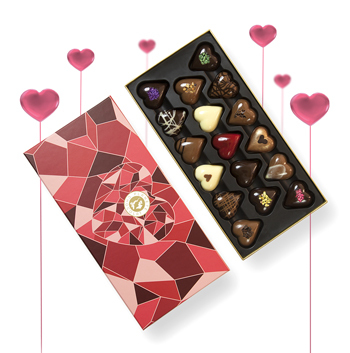 Delicately decorated by hand, these heart-shaped pralines and ganache chocolates in a variety of flavors have a taste that is as special and unique as their ultra-chic looks! 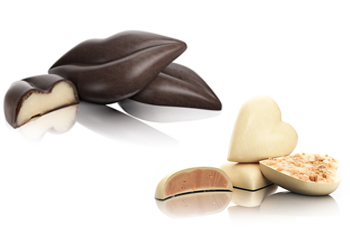 Our little heart-shaped loose chocolates are also available for you to convey your message of love. 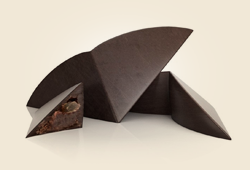 The exceptional shapes of these chocolates will bear witness to your unconditional love. Take after the most famous couple in history. What could be lovelier than giving your sweetheart a small box of pralines inspired by Romeo and Juliet with a plethora of different flavors? The ideal gift for an intense movement of flavor for two. Absolutely perfect for lovers, the temptation package invites you to open your heart and indulge your passions together. An unforgettable way to celebrate Valentine’s Day. Create your own box of chocolates. Our pralines, shaped like a set of lips, with their strawberry ganache or our Brazilian praline hearts are also an exceptional choice to impress your beloved, so why not get carried away by your inspirations as you make your selection. 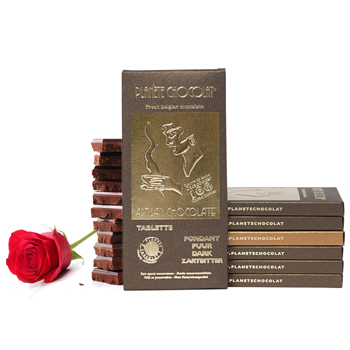 A collection of chocolate bars, each more delicious than the last, designed specifically for romantic couples. 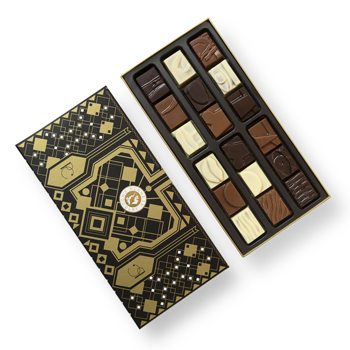 From the rose bar, which symbolizes passion, to the ginger bar that is known for its aphrodisiac virtues, this collection will invite you to open your heart and love for all eternity. Having trouble deciding between flowers and chocolates for Valentine’s Day? 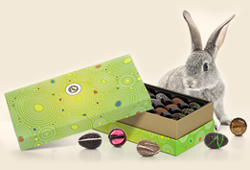 Planète Chocolat can take care of that, with the Brussels Bouquet! Warning: delivery only within Brussels and the surrounding area for this item. 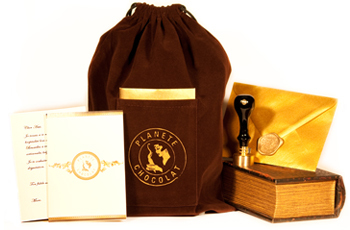 Don’t forget that our little velvet bag is also available with the message of your choice for your soul mate. Dive deep into the heart of our workshop and discover, step-by-step, how our heart-shaped pralines are made.